Mexico is one of the world's greatest travel destinations with millions of visitors touring there safely every year. The image of Mexico as a dangerous country with crime in every corner is far from the truth. Still, it's never a bad idea to take a few precautions - whichever country you visit. Want to learn a few tips to assure an enjoyable trip? 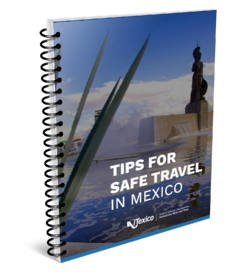 Download our Safe Travel Guide and make the most out of your traveling experience whether as business or leisure visitor.